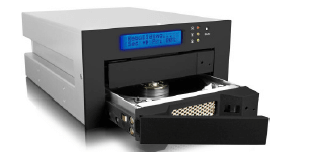 iR 2620 accommodates 2 of 3.5 ” SATAII hard drive and offering both RAID 0 and RAID 1 functions . Uses the RAID 0 function to integrate the capacity of two hard drives and to enhance both read & write performance. On the other hand, uses RAID 1 function for data redundancy by mirroring data among both hard drives to prevent the event of a hard drive failure causes system shutdown.